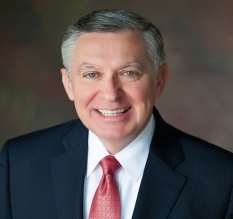 At the 76th Church of God International General Assembly, Dr. Michael L. Baker was appointed as Chancellor of Education for the Church of God. Shortly following the General Assembly, he was elected by the Pentecostal Theological Seminary Board of Trustees as Seminary President. This action was approved by the Church of God International Executive Committee. Dr. Baker has attained comprehensive and mature experience in the following: pastoral ministry; administrative and executive leadership at the local, state and international levels; higher education; leadership development; communications; public relations; author/writer; conference speaker, and much more. During his ministry career, Dr. Baker has served the Church of God and the evangelical community in a wide spectrum of ministry activities. Dr. Baker served for twelve years as an Administrative Bishop in Virginia and North Georgia; fourteen years in local church pastoral ministry; twelve years at the Church of God International Offices as the Director of Communications; fourteen years as Director of the Church of God International General Assembly; member of the Board of Directors, Lee University; Chairman, Board of Trustees, Asian Seminary of Christian Ministries, Manila, Philippines; Chairman, Board of Directors, Peniel Rehabilitation Ministry, Johnstown, Pennsylvania; member of Church of God World Missions Board of Directors; Academic Dean—East Coast Bible College; member of NRB (National Religious Broadcasters); member of NAE (National Association of Evangelicals); member of the World Pentecostal Fellowship (WPF); and on numerous church, community, and civic boards and committees. He has witnessed success both within the Church of God and as a representative to a wide variety of external public and religious groups. He served as the Coordinator of the 17th Pentecostal World Conference in Jerusalem, Israel (1995) and 18th Pentecostal World Conference in Seoul, Korea (1998); Conference Coordinator of NAE (National Association of Evangelicals); and consultant to many parachurch organizations as well as other denominations. He has substantial experience in communication skills including television, radio, media production, internet ministry and other mediums. Dr. Baker has authored numerous articles and books including recent editions of You and Your Church—2nd Revised Edition; editor and contributor to Jesus Walk and Faith Walk; Spiritual Leadership: Responding to the Call; Gaining Spiritual Vision for the 21st Century; and contributor to various publications. Foremost, he is an outstanding speaker, sharing in conferences, conventions, seminars, church events, and civic gatherings across the U.S. and around the world. He has been recognized for his accomplishments in Outstanding Young Men in America and Who’s Who in Religion. Dr. Baker also received recognition from the Governor of Georgia for his personal engagement in the State of Georgia. Dr. Baker has been very involved in civic and community services including Chairman of the Board of Directors, Federal Housing Authority, Randleman, North Carolina; United Way; March of Dimes; Boy Scouts of America, and other agencies. His wife Sharon is a vital part of every facet of their ministry. They have one daughter, Kysha, and one grandson, Michael, both their pride and joy!